The first is a hunting lifestyle. Everyone knows of it. Do any of you hunt for your living? You are all modern people—you don’t know how to hunt, how to carry a gun. Your food sources are produced from the earth. What do people who live by hunting eat? (Game.) They eat the birds and the beasts of the forest. “Game” is a modern word. Hunters don’t think of it as game; they think of it as food, as their daily sustenance. For example, they would be happy if they got a deer. “Great, this deer is enough food for the family for several days.” When they get this deer it’s just like a farmer getting crops from the soil. A farmer gets crops from the soil, and when he sees his crops he’s happy and feels at ease. “For now there’s something to eat; we don’t need to fear going hungry.” The family won’t be hungry with crops to eat. His heart is at ease and he feels satisfied. And a hunter also feels at ease and satisfied when looking at what he’s caught because he doesn’t have to worry about food anymore. There’s something to eat for the next meal, there’s no need to go hungry. This is someone who hunts for a living. What kind of environments do people who subsist on hunting usually live in? They live in the mountain forests. The majority of them do not farm or plant crops; they live in the mountain forests. Is there arable land in the mountain forests? It’s not easy to find arable land, so they survive on various living things, various types of prey. This is the first lifestyle that’s different from regular people. The second type is a herding lifestyle. Those who herd for a living don’t farm, so what do they do? Just herd? If anyone here is ethnically Mongolian, you can talk a bit about your nomadic lifestyle. (For the most part, we herd cattle and sheep for a living, no farming, and in the winter we slaughter and eat our livestock. Our main food is made up of beef and mutton, we drink milk tea, eat parched rice, and very few vegetables. Now all types of transportation are convenient and we have all sorts of vegetables and grains. Mongolians drink milk tea, and Tibetans drink butter tea. Although herders are busy all four seasons, they eat well. They do not lack milk, dairy products, or meat. They used to live in yurts but now they all build houses.) Mongolians primarily eat beef and mutton, drink milk, and ride horses to herd their animals. This is the herder lifestyle. The herder lifestyle isn’t bad—they ride bulls and horses in the field with the wind in their hair, the sun on their faces, and they don’t have the stress of modern lives. All day they just see the broad expanses of blue skies and grassy plains. People who tend herds for a living all live on grasslands and they are able to continue their nomadic lifestyles for generation after generation. Although life on the grasslands is a little lonely, it’s also a very happy life. It’s not a bad lifestyle! The third type is a fishing lifestyle. There is a small portion of humans that live by the ocean or on small islands. They are surrounded by water, facing the ocean. This type of people fish for a living. What do these people who fish for a living rely on for food? What is the source of their food? It’s all types of fish and seafood. When Hong Kong was just a little fishing village, the people who lived there would fish for a living. They didn’t farm—they went fishing every day. Their primary food was various types of fish, meat, and seafood. They would also occasionally trade some fish for rice, flour, and daily necessities. People who subsist on fishing all live by the ocean, and some live on boats. This is a different lifestyle of people who live by the water. Those who live by the water rely on fishing; it is the source of their livelihood as well as their source of food. Aside from those who farm for a living, there are primarily the three different lifestyles mentioned above. 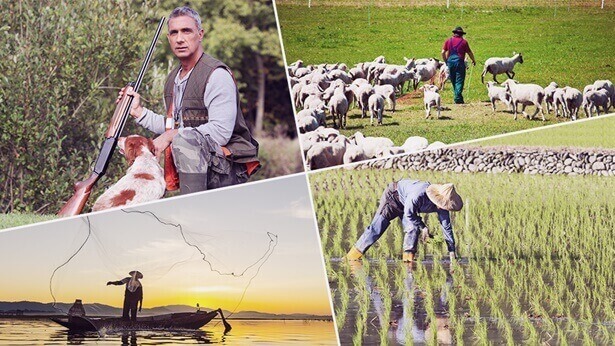 Aside from those who subsist on herding, fishing, and hunting, the majority of people farm for a living. And what do people who farm for a living need? They need soil. Those who rely on farming for their livelihood primarily grow crops for generations. They get their food from the earth. Whether they plant vegetables, fruits or grains, they all get their daily necessities from the earth. What are the basic conditions for these different human lifestyles? Don’t they require basic maintenance of their environments for survival? That is to say, if hunters were to lose the mountain forests or the birds and the beasts, they would no longer have their livelihood. So if people who subsist on hunting lost the mountain forests and no longer had the birds and the beasts, they would no longer have a source for their livelihood. In which direction would that kind of ethnicity head; where would that kind of people go? The ability to survive or not is an unknown quantity and they could just disappear. And those who herd for their livelihood—they rely on the grasslands. What they truly depend on is not their livestock, but it is the environment in which their livestock survive—the grasslands. If there were no grasslands, where would they graze their livestock? What would the cattle and sheep eat? Without the livestock, what livelihood would the nomadic peoples have? They wouldn’t have one. Without a source for their livelihood, where would a people go? Ongoing survival would become very difficult; they wouldn’t have a future. With no water sources, rivers and lakes would dry up. Would all those fish that rely on water for their lives still exist? Those fish would not exist. Would those people who rely on the water and the fish for their livelihood continue to survive? If they didn’t have food, if they didn’t have the source of their livelihoods, those peoples would not be able to continue to survive. As soon as there is a problem with their livelihoods or their survival, those races would no longer continue. They wouldn’t be able to survive—they could disappear, be obliterated from the earth. And if those who farm for their livelihood lost their soil, what would the outcome be? They wouldn’t be able to plant things, they wouldn’t be able to get their food from various plants. What would the outcome be? Without food, wouldn’t people starve to death? If people starved to death, wouldn’t that type of human be wiped out? So this is God’s purpose in maintaining various ecological environments. He only has one purpose in maintaining various environments and ecosystems, maintaining the different living beings within each environment—it is to nurture all kinds of people, to nurture people with lives in different geographical environments. If all beings lost their own laws, they would no longer exist; if the laws of all beings were lost, then the living beings amongst all beings would not be able to continue on. Humans would also lose their environments for survival that they depend upon for survival. If humans lost all of that, they would not be able to continue to live and multiply generation after generation. The reason humans have survived until now is because God has supplied mankind with all beings to nurture them, to nurture mankind in different ways. It is only because God nurtures mankind in different ways that they have survived until now, that they have survived until the present day. With that type of fixed environment for survival that is favorable and orderly, all kinds of people on the earth, all kinds of races can survive within their own prescribed scopes. No one can go beyond these scopes or these boundaries because it is God that has delineated them.